“We make a living by what we get, but we make a life by what we give.” Easy to churn out meaningful quotes, very hard to live by them. 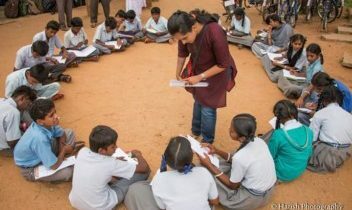 But here’s Supriya Kulkarni, volunteer at Aviratha, a non-Governmental organization engaged in activities related to overall human development. In this post, Supriya describes the sense of joy and happiness she feels doing what she does. My biggest regret is not having joined Aviratha the year it was founded. Aviratha means ‘incessant’ in Kannada and we are a group of well-meaning professionals, from diverse professional backgrounds that have come together to bring about equitable development across education, health, environment, arts & culture, and literature. The fact that what we do at Aviratha has a very positive impact on the lives of students and parents alike, in itself gives us a sense of joy and happiness. This is what gives us the energy to wake up at 4:30 AM over weekends in spite of having had a hectic week at work, as we prepare to travel to remote and far flung areas across Karnataka. One of our biggest achievements was when we had principal/HMs of schools in the rural areas telling that we have helped them retain students in school and improve their attendance. Personally, being associated with Aviratha has helped me get over the “complacency of life”. After attending and leading several events I have realised that yes, I too can be a sunshine in someone’s life. There are people out there in whose lives you can make a difference just by giving them a patient hearing, a soothing touch and a genuine smile. Also towards the end of every school visit/session, the kind of response we get from the kids is sufficient to keep us going. Somewhere in our hearts, we know that the small contribution that we make towards shaping the future of the country, has been well received. The smiles and hugs say it all. Through The Wonder Women World platform I would like to request more women especially those with kids to be involved in some form of community service. As women, we are more adept at connecting emotionally with people in a short span of time and it is this quality that comes handy when you begin making contributions in the social sphere. As mothers, when you get your kids along it really helps them connect to the society and bond with the less privileged, leaving an everlasting imprint on their young minds. They begin to understand the “Joy of Giving” when they see their parents themselves being involved in it. Also dear women, we definitely know that nothing is impossible in this world. It is just a matter of time before we come out into the open and pursue what we love doing with all our heart overcoming all limitations because it is all in the mind. If you want to do it, nothing can stop you! Very inspirational Supriya. Phenomenal work. ! Truly a wonder woman you are!! Kudos to you.. Excellent and inspirational as well. Pls keep up this good work and great to see the rural students being benfited through Aviratha. PL move ahead with. New ideas. Great work. Very inspiring indeed. The collective efforts of people like you is bound to make a profound difference to society in time. Wish you all the best. Wish you all the best Supriya. Please continue to this noble work. This is just the beginning of another great journey that will be telling. Awesome work and just keep at it touching more lives. Commendable to do something like this for 9 years nonstop.. You are definitely living up to the name of the NGO ‘Aviratha .